My Crochet Snowfall hat is one of my very favorite crochet hats! This one and of course, my buffalo plaid slouchy are so fun to make and super cute to wear. It’s fun doing that little bit of fair isle color work, and the finished crochet hat is so pretty. I hope you aren’t intimidated by the color work because it’s not difficult to do! When you watch the video tutorial, you will see it’s not as hard as it looks, and I think you will be totally hooked (pun intended)! I followed up the hat with a snowfall mitten pattern, but due to the popularity of this hat, I decided to write more sizes. 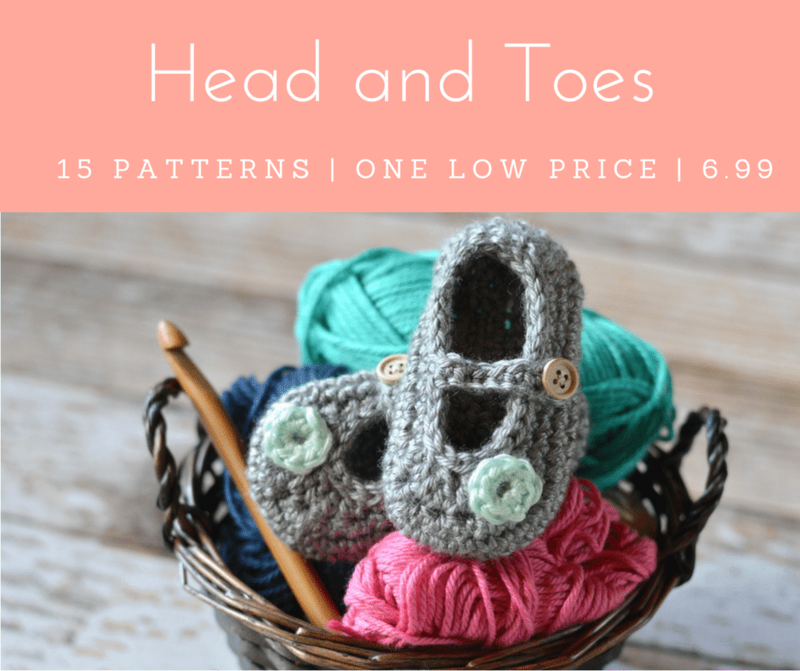 This free pattern includes Baby, Toddler, Kid and Adult sizing. However, if you need more specialized sizing, changing it up slightly is fairly easy because it’s worked from the bottom up. You simply add a few more rows to the ribbed band, then add more stitches to the hat body in multiples of 4. Note: I am changing how I am writing my crochet hat patterns with ribbed bands. First, I will not be giving a row count, you will need to measure your band to make sure it is the correct size. Second, I am changing the way I measure. To get the measurement, you want to gently stretch the band outwards. If you are having to yank it to make it long enough, then it’s too small and you need to work a few additional rows. This will ensure than your hat is big enough for your head, but snug enough that it won’t loosen over time. If your band isn’t stretchy at all, then your yarn might be too stiff for this project! Special Stitch: Snowfall Stitch- Work this “half” sc by inserting hook, yarning over with second color, pulling it through. Drop second color, and finish the stitch with first color. I have also included a video for the adult hat pattern. If you unfamiliar with how to work the “snowfall stitch”, the video demonstrates it. Slip stitch the short ends of the band together. Turn the band so the seam is on the inside and the loop is at the top. Continue to the hat body. 6. – 9. Repeat rows 2 – 5. 6. – 11. Repeat rows 2 – 5, respectively, until you reach row 13. 6. – 15. Repeat rows 2 – 5, respectively, until you reach row 16. 2. Ch 1. Hdc in same st. Hdc 6 in back loops only. Hdc in last st, through both loops. 6. – 17. Repeat rows 2 – 5, respectively, until you reach row 18. 18. Ch 2. (work with 1st color only) Dc in same st. *Dc2tog. Dc* work all around the hat. Join with sl st. (48 sts). Tie off all the ends. Thread a length of yarn onto your darning needle. Turn your hat inside out and sew a running stitch, going in and out around the very top. Pull the ends and cinch shut. Tie the ends in a firm knot. Turn right-side out and finish with a pom-pom! You can make a pom-pom using this tutorial. Or try making a fur one! 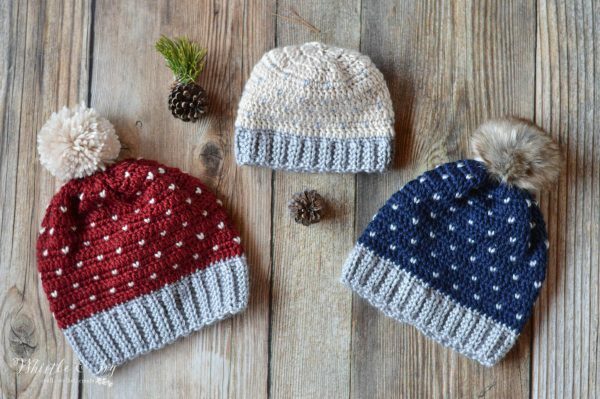 These crochet snowfall hats are so fun to make! And if you love the Snowfall technique, you must make matching Mittens or a Christmas stocking. And I am planning a Snowfall Week, so comment or email me with your requests! I usually carry the yarn so you can’t see it. You could line it, maybe? I think you have a typo in the toddler pattern. You say rows 6-11. Then until you get to 13. But 13 is a decrease row. Thank you so much for bringing this to my attention, I appreciate it! I have fixed it. 72 is correct, its a beautiful number that is a multiple of many other numbers to I use it with almost all my adult sized hats. If it’s not enough, it’s possible you may need to go up a hook size. Hi, your snowstitch pattern is beautiful! I’m just wondering why the pattern I’ve found first says: ch 7 for the ribbed band, after slip stitching it together work 72 sc around. I’m wondering because in the teen/adult size hat you say: ch 9 for the ribbed band (and I’m fine with it) but again I shall work 72 sc all around after joining? Excuse me, I’m just wondering if there might be a mistake…..
Hello! What do you mean “found first.” ? 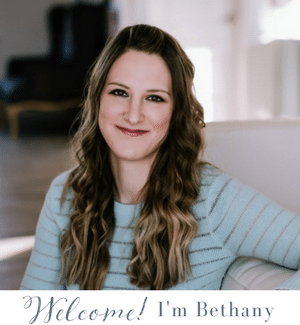 Hi Bethany!!!! In your original pattern, before you wrote all the other sizes, when you start the first row with the snow stitch, you start it as as ch1, Sc in same stitch, sc in next stitch, snow stitch (meaning Sc2, then snow stitch) and then you start the repeat of *sc3, snow stitch* all the way around. It’s like this in the video as well. However, in all your newly written sizes and even in the teen/adult on that page, you jump right into the repeat after the sc in that row, having it written as ch 1 *sc3, snow stitch*. So I was just wondering which was correct and if will throw off the look of the pattern of the snow stitch in the hat if I’m not doing the initial Sc, snowfall stitch and going into the repeat of *sc3, snow stitch* Thanks for the great pattern, btw helpful videos! They would both work, the updated version simply starts the pattern one stitch over for all rows, so it will be not be off at all, the other row is moved over a stitch as well to compensate. You can work it either way, I just made that small change for my own perfectionism. I can relate!!!! Thanks Bethany for responding so quickly. Have an awesome holiday and thank you so much for all your hard work that goes into pattern writing. Fall is about to start here in Colorado like this weekend. 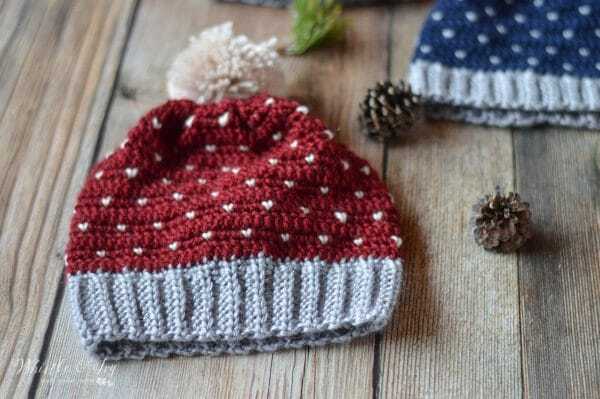 I am getting ready and buying knitting supplies for the season <3 Your hat is my favorite pattern this year, so I have to make it! Just one doubt: how many balls of each color have you used for the adult size? Isn’t fall wonderful!? Colorado is very beautiful in fall and winter! I actually used less than one 5g ball. Sorry! I meant 100g. Not sure where 5 gm came from! You are welcome, I am glad you like it! I’m afraid that 17 rows is too much for the hat? Can someone help me? It is a slouchy style hat, is that what you mean? I’m so excited! I loved this stitch but it looked like it would be hard to make. I watched the video, tried it and it was so easy. I love it. Thank you so much for taking the time to do all this for us and especially for providing it free. That is so kind and generous! I just have one question though. I carried my second color along crocheting over it as I went and now that I look at my work I see that you can somewhat see that second color thru the tiny openings in the sc. Is this normal or am I doing something wrong? Hi Ruth! Glad you like the pattern! Make sure you gently pull the carried yarn, as show in the video, it closes the gaps a bit. It may show a bit depending on your colors, though, so that is normal. If you hate it, you can drop the yarn and pick it up when you need it again (the fair isle technique). I am wondering if I am not doing this correctly. It looks right but when I tried it on, it was way too small with no stretch. What do you do with the second yarn color? I was weaving it in as I went, but now I am wondering if that’s not the way you are supposed to do it. Hello! What yarn did you use? Also, did you have a chance to watch the video? You are so very welcome! I am so glad you like it! Where do I find the link fot the video? I still do not see the link. I have looked like by line. It s not visible. For anyone having this problem in the future, ad-blockers block inbedded videos, turn it off and it should appear. I just finished the hat and have also completed one stocking. I love these patterns! Thank you. I’m confused: On the Baby Hat row 11 the pattern calls for 16 decreases and a double crochet. You cannot possible get 17 stitches from the 37 in the prior row that way. I am assuming you meant 18 decreases and finish with a dc for a total of 19 stitches. I then followed up with Round 12: 9 dec, 1 dc (10 sts) and finished with Round 13: 5 dec. Does this sound right? Oh dear, you are right! I am not sure what happened there, but that is not correct. Your improv was great! I will try to get this fixed today, thank you for letting me know! Justo hago el mismo, sólo que por el grosor de la lana me dio justo para un tamaño adolescente/adulto. En la fila 10 me da 38 y no 37 puntos. HI, I’m Australian and have just made the snowfall hat. Managed to translate the pattern to Aus crochet speak ;-) I used wool, which is less stretchy so the hat not as slouchy and I had to add rows to make it big engouh but it still looks great. Thanks so much for the great and easy pom pom instructions and the You Tube tutorial. HI! 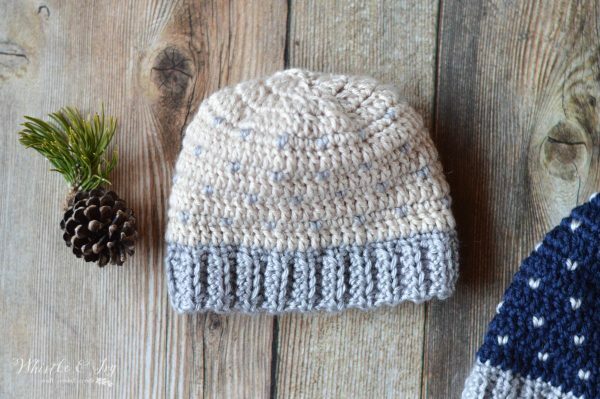 I love the snowfall hats and am eager to make them. I have never used the snowfall stitch and want to learn how to do it but I do not see where your tutorial video is… could you please let me know where to find it? thank you. Thanks! It’s the video just under the “Buy the PDF” graphic. 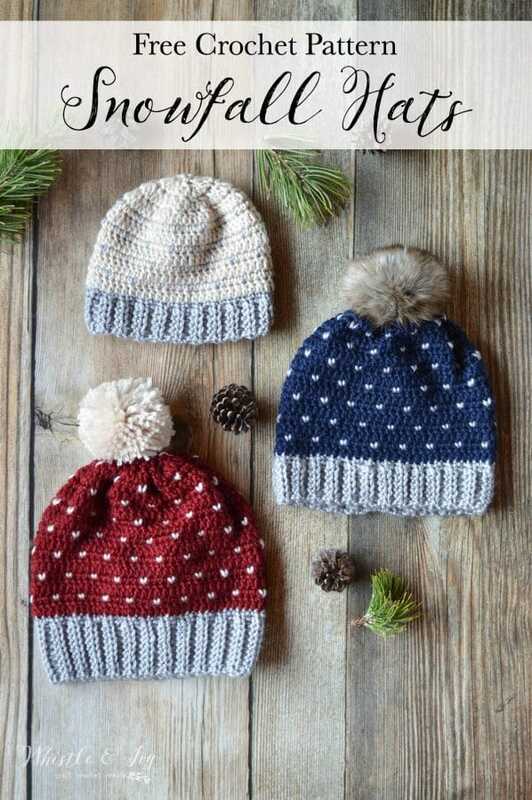 Just started crocheting in January and have made one of these hats already, they are awesome! Just wondering how to adjust the pattern to use a bulkier yarn (5)? There’s so much info out there and it can be overwhelming and confusing! Hi Jill! You can adjust the pattern by making the brim the length you would like (any length). Then the body of the hat would need to be in multiples of 4. Does that make sense? 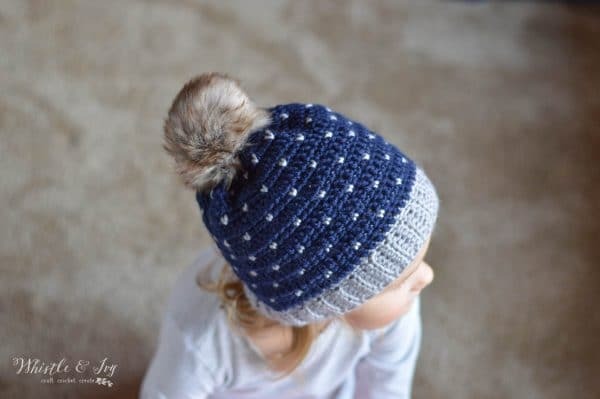 Love this hat and pattern! I made 2 in 2 days because I loved it so much! Great tutorial and instructions! Yay! So glad you love it! Thanks so much! I want to make this hat but for a 0-3 mon baby. I’m still an amateur at crocheting and I am not sure what the starting number chains should be.. any suggestions would be greatly appreciated! You can make the band the same height as the baby, so it would be the same starting chain, but make it shorter, about 12″ or so for newborn. 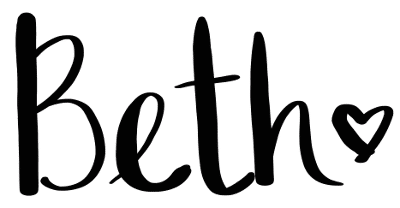 I am so grateful for crochet bloggers like you! Simple and modern free crochet patterns in all sizes for someone like me who taught myself from YouTube! I’ve fallen in love with the unique and special gifts you can make by crocheting! Such a beautiful art that is being modernized by people like you so others can see how amazing it is and that it’s not just for your grandma! Thank you again! Thank you for your kind words, Katie! You are very welcome! I like the pattern. I made the adult size. I noticed the pattern didn’t say to slip stitch the band close. I figured it out because the pattern stated to sc crochet 72 around. I liked it because it isn’t too tight. My husband hates hats, but liked this one. Thanks! Thanks for pointing that out, I will fix it. Thanks so much! Size 1 to 3 year old (toddler). Should row 12 be row 13 and total rows equal 15 or should there be total 16 rows with missing row 12? Thank you for catching that! There is 14 total rows, so there is no missing rows, just a mistake with the row numbers. Thanks for letting me know! Are you supposed to cut the second color yarn anytime? Yep, once you are done with it. Please tell me what a mighty stitch is? It’s the yarn I used to make the hat. The link takes you to where you can purchase it. Hi Beth, the hats are beautiful. Did you already plan to create a coresponding scarf? This would be great! Its stunning! I just ordered 3 skeins! Thank you!! Thank you so much…Just hope I can grasp the Knit Stitch.. Yes you can! The video might be helpful as well! The video is so helpful to learn the knit stitch and how to carry that second color. I rewound the video 3 times to learn it and figured it out. My new favorite pattern! Love this pattern! I did notice a little error on the teen/adult size on the hat body, row 1, it says 64 sts but I think it should say 72. Anyway, I do love it! Thank you!! Do you post printer friendly patterns? I do not. I do post PDF’s that you can download for a small fee, but I haven’t gotten to this pattern yet. I will try to get to it as soon as I can! Thanks for the great pattern. Question-on the adult pattern if you start with 8 stitches on row 1, should it then be 6 hdc in the back loops for row 2? Otherwise you seem to come up short, correct? Thanks again! Thanks so much for catching that, you are correct! Thank you! Thank you, love this pattern and you did an excellent video. You are so kind and generous to give this pattern free. I ate and donate to an organization that distributes to cancer patients around the country. I will be making and donating many of these because I love them! Thank you. That is wonderful and generous of you! !